Heat cylinders / barrels of plastic processing machinery / soft metal melting pots / Vessels / where the heaters are installed without cover and in visible manner. Ceramic knuckles withstand very high temperature and it is much rugged in compare to micanite insulating sheet. Power - up to 40 Watts / Sq. inch can be accommodate with simple type / On-Off temp. Controlling system. And higher wattage i.e. up to 50 Watts / Sq. inch can be provided if the heater will be operated through thyristor based temp. Controller. Suitable for max. surface temperature up to 700° C.
Heater will have double jacket. First jacket will prevent radiated heat loss and Second / Outer jacket will keep hot surface hidden inside and will not give scorching effect if touched mistakenly. So, it is much safer for the machine operator. This jacketed heater will save power considerably, by preventing heat loss. It heats the job more quickly & efficiently, thus increases productivity and decreases lost of time. 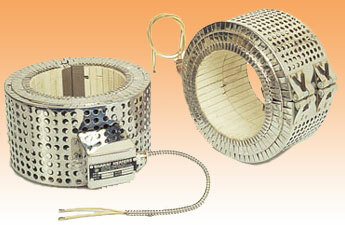 This heater is tailor made / can be fabricated as per specific requirement. (size, rating & supply voltage). Ideal electric Joule Tech for heating cylindrical surface.